Utopia region surrounded by her family and kin. 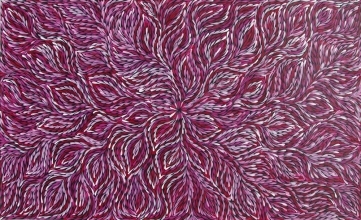 Utopia is renowned for its development and nurturing of extremely talented Aboriginal artists including, Emily Kame Kngwarreye. Janet’s grandfather is Old Henry Pitjara and her grandmothers include Angelina Ngale and Polly Ngale, both of whom are notable artists. 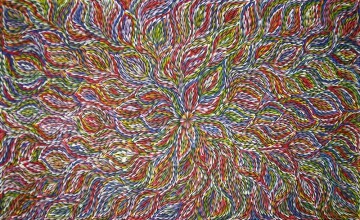 Her uncle is Greeny Purvis Petyarre (who sadly passed away in 2010), another well known, talented and collectable artist. Janet began painting in 1997 and was taught the skills of art depiction by her family. She is married to fellow artist Ronnie Bird Jungala who is the grandson of famous Petyarre Sister, Ada Bird Petyarre (who sadly passed away in 2010). Together Janet and Ronnie have four children. treat a variety of ailments. Both men and women have important roles to play within the community as healers. 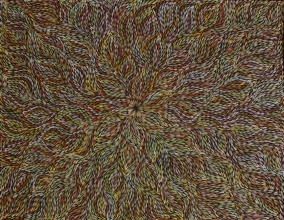 Janet also has the appropriate cultural knowledge and permission to depict the Dreamtime stories of the Mountain Devil Lizard and Emu. 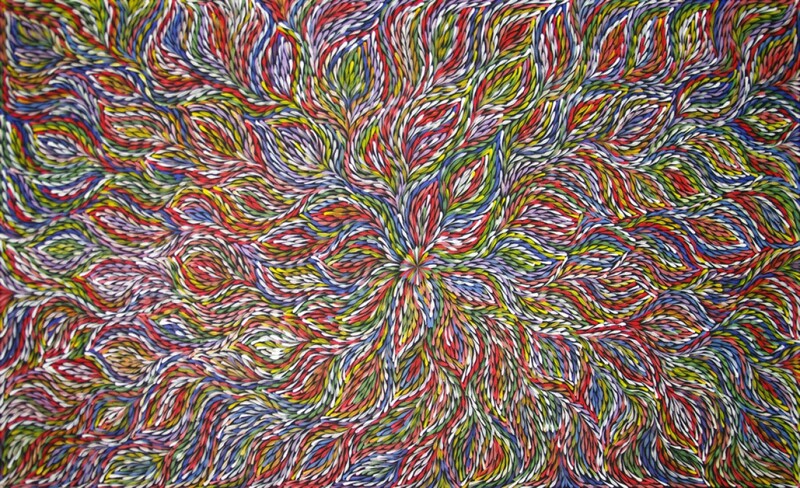 Her artworks are colourful and creative, adding her own personal touch to these Dreamtime stories which have become famous by Utopian artists since the 1980’s during the Utopian art movement. Through her work with several art galleries around Australia, Janet has participated in several overseas group exhibitions and some of her artwork is held in the Mbantua Gallery’s permanent collection. 2008, “A Women’s Exhibition”, Red Rock Gallery, Beijing, China. 2008, “2nd Gallery Opening”, Red Rock Gallery, Beijing, China. 2004, Mbantua Gallery USA exhibitions, Knoxville & Tennessee, USA. 2003, Mbantua Gallery USA exhibitions, Knoxville, Nashville & Portland, USA. 2002, Mbantua Gallery USA exhibitions, Knoxville, Nashville & Portland, USA.